Number 14. 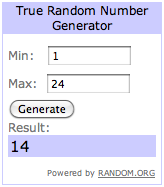 Guess who is "Number 14"? Kate!! Yes, my blog friend Kate won. I almost felt guilty that she won...then I figured, hey, it was fair and square and a deal is a deal! So, CONGRATS Kate! I'll get your super fabulous marinating dish out to you soon! Raise your hand if you like Chicken Fajitas *raises hand SUPER high in the air and gives it a little wave, too*. Yum. 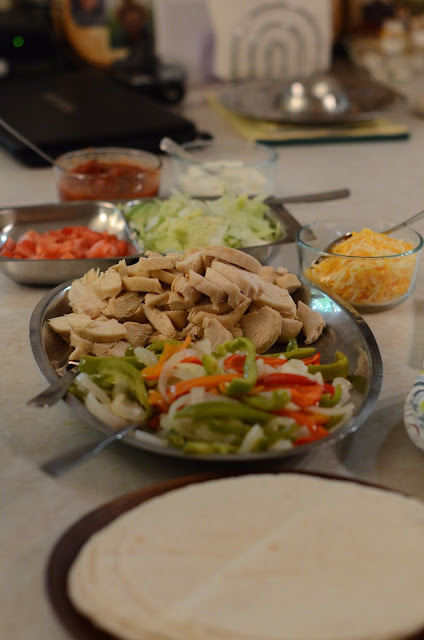 Chicken Fajitas make the world go round. 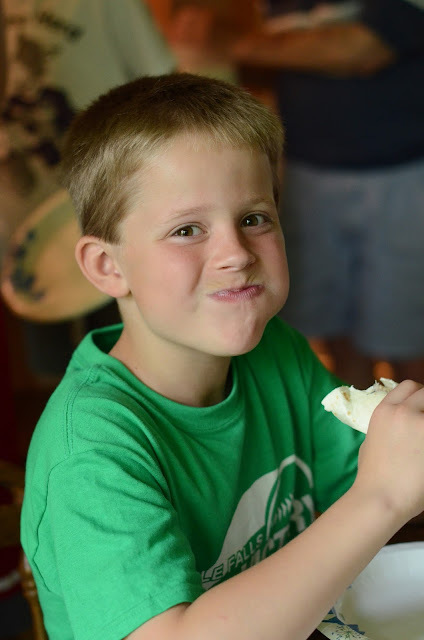 When you have a Chicken Fajita, all is right with the world. This recipe is a super easy recipe...quick, too, the way we did it, although, I'd love to try the chicken and veggies grilled! Are you ready for some delicious eats? Then read on! Plus salt...and garlic, which I forgot to put in the picture 'cuz I'm super on the ball like that. Then, grab your chicken breasts and put them in your handy dandy Tupperware marinating thingamajig. Oh, what's that you say? You don't have a Tupperware marinating thingamajig? Well, read on and I'll tell you all about how you can win one! From little ol' me. Just 'cuz I like you. Pour some marinade over the chicken (I did more than the recipe called for because I really wanted them to be bathing in it, reserving some for the veggies, later. And, remember that reserved marinade I mentioned above? Throw the peppers and onions together and pour the marinade over them, toss to coat. Now for the "super easy" part of this recipe...microwaving the meal. Zap your chicken until it's done...took us 18 minutes for 8 boneless, skinless split breasts. When that's done, zap your veggies for about 8 minutes, then..."Assemble da minions!!" (Name that movie...) And, actually, we're assembling fajita fixings, not minions. And lay out the veggies and chicken on a platter for easy assembling! So, want to know how you can try to win that handy Tupperware marinating container? I thought so! Just leave me a comment on this post. Any old comment is fine! For an extra entry, pin this recipe (just click the "Pin It" button below!) and leave me another comment telling me you pinned it! Winner announced Monday, June 17th! Combine together in bowl, whisking well. Place chicken breasts in container, pour at least 1 cup of marinade over chicken breasts and marinate at least 4 hours, or overnight. Turning occasionally. When read to serve, microwave (on high) chicken breasts, in marinade, in 6 minute increments, turning occasionally, until no longer pink in the middle (for 8 chicken breasts-we doubled the recipe-it took 18 minutes). Slice into thin strips, cutting against grain. Pour at least 1/4 cup of marinade over veggies and microwave (on high) for 8 minutes, or until onions are translucent and peppers have softened slightly. Heat tortillas according to directions on package. 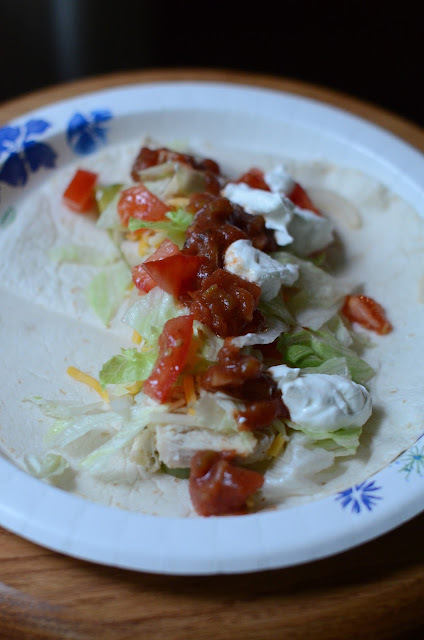 Grab a tortilla, pile on the chicken, veggies and your favorite fajita fixings and enjoy! I definitely want to try the marinating dish! It looks fantastic! Also, chicken/steak fajitas are my favorite food! I never thought to microwave them. I just pinned this recipe as well! Thanks! Yum! I love chicken fajitas, can't wait to try this. I pinned this too! We love fajitas here too!!! I have never tried chicken cooked in the microwave..but this looks yummy so I will have to try it!! For how full my cupboards are, I can't believe a marinating dish is not in there! Yummy! Seems too easy yo be true! The recipe looks easy and it sounds delicious! I never knew a marinating dish existed. Super cool! I love Tupperware like I love air. And m&ms. And YOU! And can I get an AMEN for a beautiful day in The Land of 10,000 Lakes?! Oh these look soooooooo good! this junior nursing student needs new ways to cook! would love this! Thanks for the recipe, great idea to microwave it! Thanks for another yummy recipe! My husband would love the marinating dish for his grilling creations! I never thought to microwave the chicken and veggies....I usually bake ours. Will definitely have to try this! I meant to try this, but forgot the lime Ade. Soon!